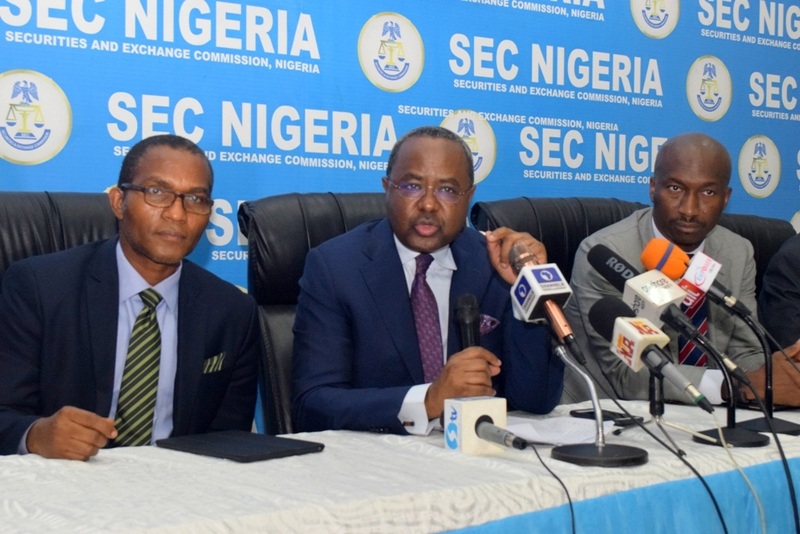 An alarm has been raised by a human right, good governance and non-government organization known as Campaign Against Impunity in Nigeria over alleged attempts to surreptitiously close investigations against the suspended Director General of Securities and Exchange Commission (SEC), Mr Mournir Haliru Gwarzo. Speaking on Thursday in Lagos at a media briefing, the group said it found it curious that weeks after its sister organisation sent a formal petition to President Muhammadu Buhari, the leadership of the National Assembly and the anti-corruption agencies, not a single arrest has been made so far. The group also urged the Minister of Finance, Mrs Kemi Adeosun, to order a thorough audit of the finances of the commission. Recall that the Centre for Anti-Corruption and Open Leadership (CACOL) had petitioned the President, National Assembly and security agencies, accusing the embattled SEC boss of paying himself N104.8 million as severance package. While addressing newsmen yesterday at the Rights House, CDHR Secretariat, Ikeja, Lagos, popular human rights activist and leader of the Campaign Against Impunity in Nigeria team, Comrade Shina Loremikan, noted that his group had followed with keen interest issues revolving around allegations of gross abuse of office and official recklessness levelled against Mr Gwarzo. Comrade Loremikan said, “We find it disturbing that apart from the initial invitation and questioning of Mr Mounir Gwarzo for just a few hours by the Independent Corrupt Practices Commission (ICPC), nothing has been heard by the public on the status of the investigation. According to Comrade Loremikan, It is in view of the lukewarm attitude of the government and the anti-corruption agencies to this issue that “we hereby urge the Economic and Financial Crimes Commission (EFCC) to quickly make public the outcome of its ongoing investigation into the activities of Mr Mournir Haliru Gwarzo’s as the Director General of the Securities and Exchange Commission. On January 2, 2013, Mr Gwarzo was appointed an Executive Commissioner in SEC for a four-year tenure by the then administration of President Goodluck Jonathan. Before the end of his four-year term, Mr Gwarzo was promoted by same government as the Director General of the commission on May 22, 2015. Mr Gwarzo allegedly ordered the payment of a severance package of the sum N104,851,154.94 to himself. Mr Loremikan said the standing rule in the civil service provides that severance benefits can only be paid to an employee who has concluded his or her service and has completely disengaged from service and not to an employee who was promoted within the commission as is in the case of Mr Gwarzo. The Comrade, at the briefing, asked Mr Gwarzo to tell the anti-corruption agencies if he paid himself a severance package or not? If he awarded contracts to his own companies and others with links to himself his wife and some of his cronies using the privilege of his office or not? He further asked it Mr Gwarzo can deny the veracity of the incorporation records with the Corporate Affairs Commission (CAC) that the companies said to belong to him and his cronies indeed belong to them? “Why is it taking the anti-corruption agencies this long to determine the ownership of the following companies?” he queried also. Comrade Loremikan said Campaign Against Impunity in Nigeria and Nigerians also want to know if Mr Gwarzo, his wife and some directors of SEC are owners of the following companies: (1.) Outbound Investment Ltd, RC NO. 807317 (2.) Medusa Investments Limited, RC NO. 326829 (3.) Northwind Environmental Services. REG NO BN2389176 (4.) Micro-Technologies LTD RC NO. 173805 (5.) Tida International Ltd RC NO. 26414 (6.) Outlook Communications (7.) Acromac Nig. Ltd RC NO. 10687864 (8.) Balfort International Investment Ltd RC NO. 109153 (9.) Interactiven Worldwide Nigeria Ltd RC NO. 779442. Recall further that a Senior Advocate of Nigeria (SAN) and leading human rights activist, Mr Festus Keyamo, had earlier warned against recent attempts to sweep the Mr Gwarzo investigation under the carpet by powerful individuals. Mr Loremikan said at the conference on Thursday that Nigerians want the probe to ascertain whether or not Mr Gwarzo paid himself severance benefits of N104.8 million after his elevation to from Executive Commissioner to DG despite not having completed his tenure on his previous position. Concluding, Comrade Loremikan said, “Considering the likelihood that a lot more acts of impunity may have been committed unchecked under the arrangement in which Mr Gwarzo functioned as the DG of SEC without checks from a Board, the Campaign Against Impunity in Nigeria calls on the Finance Minister, Mrs Kemi Adeosun to order a thorough audit of the finances of the commission. “We also urge the Minister to stand firm and not buckle under any pressure by the campaign of impunity being sponsored by Mr Gwarzo against her person. “The entire process smells of an attempt to cover impunity with blackmail. We therefore demand that Mrs Kemi Adeosun should make public the report of the Administrative Panel put in place to investigate the allegations against Mr Gwarzo. “She should also direct her office to forward the report to the Economic and Financial Crimes Commission and the Independent Corrupt Practices Commission (ICPC),” Mr Loremikan told journalists.